Niall McNeil and his co-writer Marcus Youssef have written a play that tells the story of King Arthur from a new perspective. The tale of King Arthur and the Holy Grail has been told for hundreds of years, but perhaps never in as radically inclusive a way as in NeWorld Theatre’s adaptation. 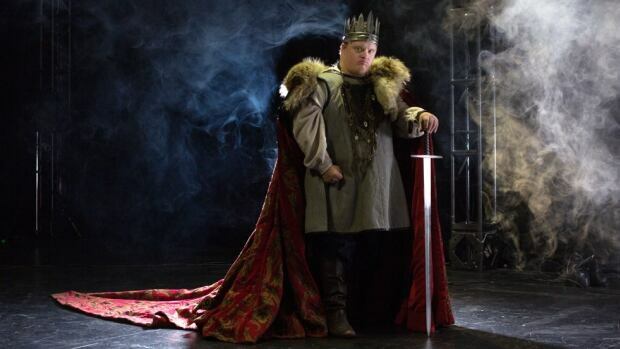 One of the writers and several of the actors in the acclaimed King Arthur’s Night have Down syndrome. “[It’s] told by actors who have very, very different kinds of cognitive perspectives or experiences,” said Marcus Youssef, co-writer of the play. That informs the way the story is told, he told CBC’s Margaret Gallagher, from the poetic language and bold projections to the addition of unusual characters, like a herd of goats. King Arthur’s Night is part of Vancouver’s PuSh Festival. It runs from Jan. 31 to Feb. 4 at the Frederic Wood Theatre. Tickets are $39 each and available online or by phone. Congratulations Niall on another great performance!